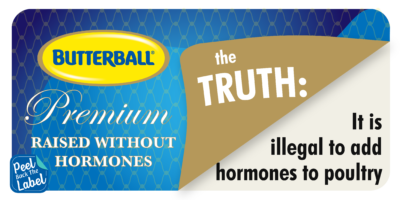 Why does Butterball need a “raised without hormones” label? Oh wait! They DON’T. Butterball — to its credit — acknowledges the USDA requirements on its website. Despite that acknowledgement, Butterball still chooses to use deceptive labeling tactics to distinguish themselves in a highly competitive space. These tactics are all about preying on consumers’ lack of knowledge, misconceptions or outright fears about their food and NOT about truth nor transparency. The truth is ALL poultry in the US – regardless of the label – has no added hormones. Enough is enough! Tell Butterball to STOP deceiving consumers with their misleading label and fear-mongering marketing by contacting them on Twitter, Facebook or writing to them today.